Gamers will be challenged to develop their own giant murderous space station in the Star Wars-themed Tiny Death Star. I was never quite able to get behind Tiny Tower. I know it has its fans and I can't count the number of times in a week I hear my wife say she "has to check on her tower," but something about it just never caught me. Apparently, the missing ingredient was Star Wars. 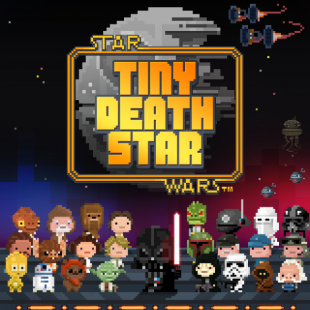 I say this because Disney Interactive, in association with Tiny Tower creators NimbleBit, have announced Tiny Death Star and I couldn't be more excited. The new game, being developed for mobile devices, will challenge gamers to "live life on the dark side and join Emperor Palpatine and Darth Vader on a mission to attract Galactic bitizens, run intergalactic businesses, and build an all-new Death Star." Players will be able to "construct unique Star Wars themed locations to attract iconic characters" to expand their own version of the iconic battlestation. Granted, from the sound of things the game will skip over some of the Death Star's more traditional activity's like planetary annihilation and what-not. That said, it will still give Star Wars fans an opportunity to revisit one of the franchise's most famous locales and see their favorite characters shrunk down to teeny-tiny, adorable 8-bit sprites. No release date has yet been announced, but Tiny Death Star's unveiling has at least confirmed that Star Wars, for all its flaws, has an unwavering ability to improve just about anything.